With 70’s style sashaying down the Spring runways, suede emerged as the fabric of the season. And we couldn’t be more excited! There’s something about it that looks so luxurious and while these pieces might be on the pricier side, they are guaranteed to last the test of time. We’re all about the investment buys! 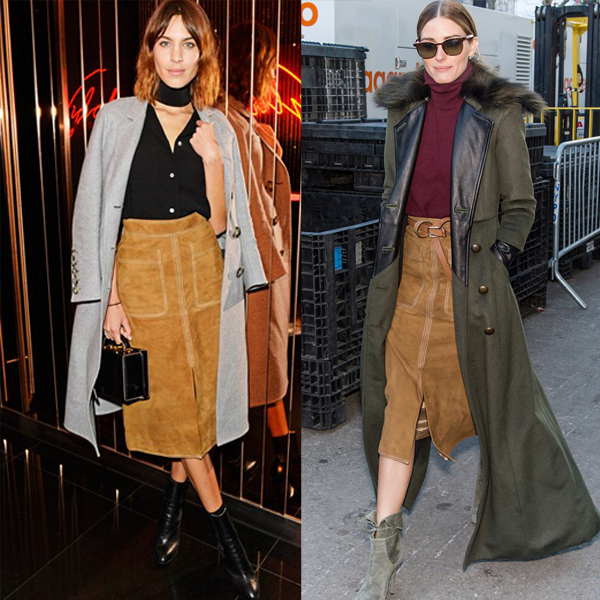 Marks & Spencer have hailed their suede skirt (above) as one of the hero pieces from the SS15 collection and it has already been given the seal of approval from style queens Olivia Palermo & Alexa Chung. It’s due to land in-stores in early April, so keep a close eye over the coming days if it’s on your lust list! Don’t you just love Olivia’s attention to detail with the knotted belt? Fabulous! Another piece that caught our eye is this stunning cape from Massimo Dutti. The colour, cut and shape are just divine. A classic biker jacket is perfect for Spring and a great transitional piece too. And if it’s accessories you’re after, there’s no shortage of suede shoes, bags and belts on the high street! Hope you like our picks!